Did Pilgrims Eat Chocolate & Peanut Butter? This is a question that I may never have the answer to. But if it’s one thing I know about holiday traditions, it’s that as much as they stay the same, there are always little things that change over the years. Thanksgiving marks the start of my annual holiday baking bonanza. After that, the month of December is spent looking for and testing out recipes that would be good to give as gifts. However, every year during my holiday baking, one ingredient is noticeably missing: peanut butter. I’m not really sure why it’s not considered a holiday staple since by my standards, it’s a very hearty and heart-warming ingredient. I suppose that tradition and the time of year sways everyone to tend more towards the usuals: apple, pumpkin, ginger and peppermint. Don’t get me wrong, I love all of those flavors, but I woke up this Thanksgiving morning sincerely in the mood for some peanut butter. Wanting something that was good enough to satisfy the craving but light enough for breakfast, I whipped out a peanut butter banana bread recipe from Peanut Butter & Co. It’s all too appropriate to use a recipe from them on a cold day like today, because just thinking about their adorable little sandwich shop in NYC makes me feel a little extra warm and cozy inside. This bread is tender and chock-full of peanut butter flavor. 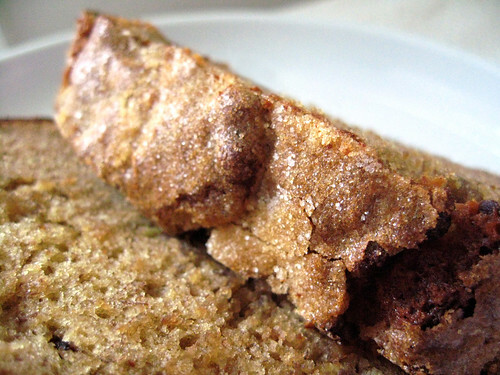 My secret with banana bread is to sprinkle a healthy coating of sugar (or cinnamon sugar) right before it goes in the oven so the top is hard, cracked and sparkling. I encourage all of you CPB’ers out there to start a new holiday tradition and welcome chocolate and peanut butter into your dessert spread (if it’s not there already). Maybe it’ll stick – after all, every tradition has to start somewhere, right? As always on Thanksgiving, I have a lot to be thankful for. On this particular day, I am thankful to have a nice, warm house to go, a loud crazy family to spend the day with and a tasty home-cooked meal to enjoy together. I hope you all have a wonderful Thanksgiving!! 1. Preheat the oven to 350 degrees. Butter and flour the bottom and sides of a 9-inch loaf pan. Cut a piece of parchment paper or brown paper bag to fit the bottom of the loaf pan. 2. In a large bowl, sift together the flour, baking powder, baking soda and salt and set aside. 3. In a separate large bowl, use an electric mixer to cream together the shortening and sugar. Add the peanut butter, bananas, and eggs, one at a time, and continue mixing until well incorporated. Fold in the flour mixture and pour the batter into the prepared loaf pan. 4. Bake for 60 to 70 minutes, or until the top is golden brown and splits in the middle. Serve warm or at room temperature with a scoop of vanilla ice cream or a dollop of Marshmallow fluff. I personally prefer mine warm with a touch of butter and a cuppa Joe on the side. Enjoy! My First Cookbook: The Cap to a Very Good Year! I made this bread last night and it is delicious! 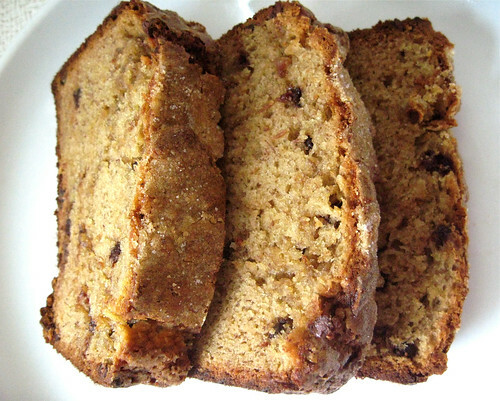 I had never thought of adding peanut butter to banana bread – clever and delectable! WOW I made this bread last night and now I like banana bread again. 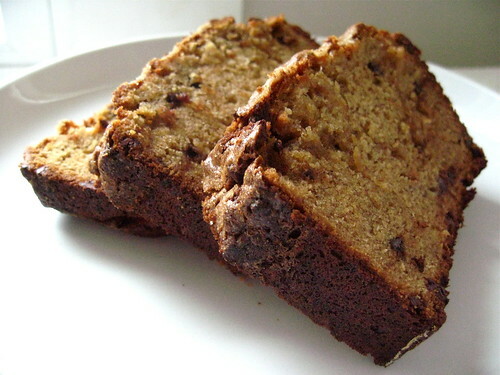 I was tired of banana bread but not now.